Please be advised that rates for our Nile River Cruises are not posted on our website. Actual rates are determined by internal policies of the Nile River Cruise operator and subject to frequent changes without notice. Rates for Nile River Cruises are based on many factors such as the time of year you plan to travel, group size, if you have children, nationality, standard of accommodations you require (standard cabin up to deluxe suites) and availability of spaces. For these reasons we find it much better to give you a price quotation at the time of your request so you know exactly what the cost is and there are no hidden costs. The rate we quote you is locked at the time you confirm your booking and will not change. This way you will have a guaranteed rate to budget and plan your holiday. Peak periods for Nile cruises vary depending on the ship however, as a general rule you can expect to pay higher rates during December 20 - January 1 and April 10 - April 30. To receive a detailed price quotation for M/S Oberoi Philae Nile River Cruise Ship please use our e-mail address: info@min-travel.com to expedite your inquiry. We will respond to your inquiry usually with 72 hours or less. Following are details and information for M/S Oberoi Philae Nile River Cruise Ship please. 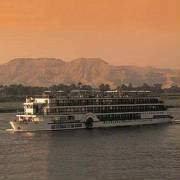 To view the day-by-day cruise itineraries for M/S Oberoi Philae Nile River Cruise Ship please info@min-travel.com. Note: Please be advised actual embarkation days and itineraries may change without notice. We do our best to keep information updated as soon as we receive notices of changes however, we do not always receive notices in a timely manner. Please ask us to confirm actual embarkation days and itineraries before confirming your reservation. Embarkation before 12:00 p.m. (noon). Lunch - felucca sail around Elephantine Island - Botanical Gardens - Agha Khan Mausoleum - dinner - folklore show. Overnight in Aswan. Breakfast - guided tour of the High Dam - Unfinished Obelisk - Philae Temple - lunch - sail to Kom Ombo - guided tour of the Kom Ombo Temple - sail to Edfu - Captain’s welcome cocktail (Smart casual attire) - dinner - disco. Overnight in Edfu. Breakfast - guided tour of the God Horus Temple - lunch - sail to Esna - cross the locks - Luxor - afternoon tea - dinner - Galabiya party. Overnight in Luxor. Breakfast - West Bank: Guided tour of the Valley of the Kings - Queen Hatshepsut Temple - Colossi of Memnon Statue - lunch - East Bank: Guided tour of Karnak Temple - Luxor Temple - afternoon tea - dinner - belly dancing show. Overnight in Luxor. Breakfast & disembarkation. End of services. Embarkation before 12:00 p.m. (noon). Lunch - West Bank: Guided tour of the Valley of the Kings - Queen Hatshepsut Temple - Colossi of Memnon Statue - East Bank: Guided tour of Karnak Temple - Luxor Temple - afternoon tea - sail to Esna - cross the locks - sail to Edfu - dinner - belly dancing show. Overnight in Edfu. Breakfast - lunch - afternoon free for leisure - afternoon tea - Captain’s welcome cocktail (elegant attire) - dinner. Overnight in Edfu. Breakfast - guided tour of the God Horus Temple - lunch - sail to Kom Ombo - guided tour of the Kom Ombo Temple - afternoon tea - sail to Aswan - dinner - Galabiya party. Overnight in Aswan. Breakfast - guided tour of the High Dam - Unfinished Obelisk - Philae Temple - lunch - felucca sail around Elephantine Island - Botanical Gardens - Agha Khan Mausoleum - dinner - folklore show. Overnight in Aswan. In order to give you our best Offer we can for Winter 2009: Kindly send us E-mail with the following information & specify Full Name, Nationality, The Expected Arrive & Departure Date (Month), Number of Person & Accommodation Required (Double/Single/Triple) Hotel Category 5 Stars (Deluxe) or 4 Stars (First Class) or 3 Stars (Tourist) & if required Domestic Flights.